Successful students will develop spiritually by understanding the teachings of the church, appreciating how spirituality complements the whole person, and becoming a contributing member of a faith community. Successful students will communicate effectively by learning the value of self-expression through sharing ideas, thoughts, feelings, and values; and by listening and reflecting on what is being communicated. In demonstrating competency as a “contributing member of a faith community,” learners are expected to give service to their families, school, local church community, and the universal church. Students will be required to demonstrate the understanding of community and service through learning experiences and active involvement. St. Charles Learner Objectives and Standards flow from the school mission statement and integrate Catholic values. These skills will be specifically refined and students will be expected to demonstrate competency in them before graduating. The aim of the religion program at St. Charles is to incorporate the Catholic Faith into the minds and hearts of students. The religion course is the very heart of our curriculum and is the very identity of a Catholic school. Religion is not just a class that meets every day, nor is it only the accumulation of knowledge about the Catholic faith. 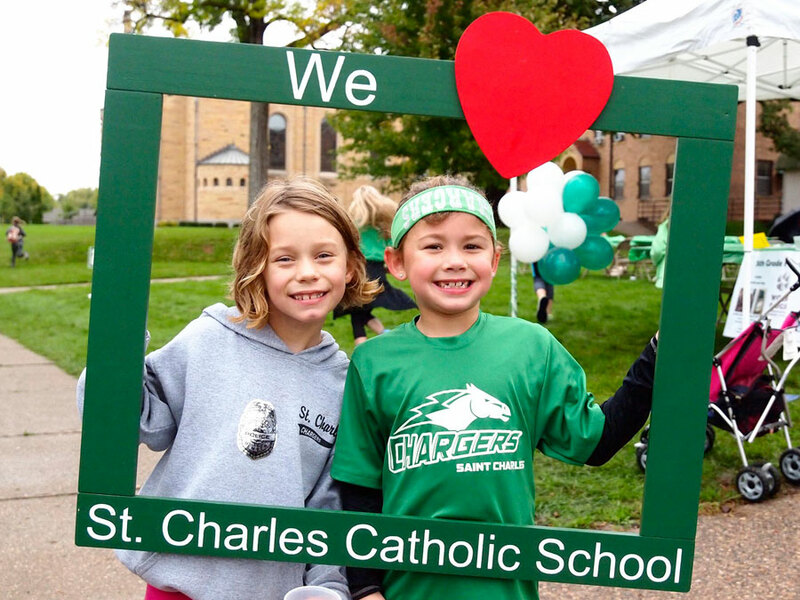 We, at St. Charles, work to incorporate faith into every aspect of the educational program. Knowledge then must result in action. As St. Paul said “Faith without love is useless.” Our purpose is to give students both knowledge of their faith and the opportunity to put their faith into action. The Image of God series is the primary text used in grades K-8. It is doctrinally solid and uses methodologies which are highly effective for understanding and implementing the faith. In grades K-5 we use the McGraw Hill “My Math” curriculum as our main resource. The strength of this program is that it is extremely engaging for kids, easily personalized for varying learning styles and abilities, and challenging at each grade level. My Math is well balanced in conceptual and procedural instruction and teaches students to be problem solvers. Option One is a more traditional style, text based approach. Teacher instruction will precede student work in the classroom. Daily homework will be used to reinforce instruction, reveal challenges, and correct improper procedures or understandings. In grades 6 & 7 students use the Accelerated Pre-Algebra program and students in grade 8 use the Algebra I program. Both of these programs are published by McGraw-Hill (Glencoe) Math and are known for their rigor. Starting Pre-Algebra in grade 6 gives our students early exposure to algebraic concepts and procedures. Continuing this accelerated program through grade 7 brings students into some of the preliminary concepts of Algebra I allowing them to progress deeper into Algebra I during grade 8. Option Two is a computer based online program called ALEKS. This option will be best suited for students who are self motivated and prefer a more personalized program. It is important to note that the instructor will have less availability during class to support students using this program. The ALEKS option allows students to accelerate their learning and work at an advanced pace, or spend additional time mastering topics as needed. Homework has a bit more flexibility than the traditional approach. Students will be assigned textbooks to use as a reference but the online ALEKS program, available to the student at school and at home, is the main resource used. Reading is a complex process that uses many skills. The ultimate goal of reading is to get meaning from print. Research shows that to become good readers, students need to develop an understanding and use of phonemic awareness (to hear, identify, and manipulate the sounds of spoken words), phonics (knowing the relationship between letters of written language and sounds of spoken language), fluency (reading text accurately and quickly), vocabulary (words used/recognized for effective communication), spelling, comprehension (understanding what is read) and writing. Our-5 English Language Arts instruction incorporates these components. Using explicit, direct and systematic instruction, balanced with creative and interactive learning activities, students learn the technical aspects of language while being encouraged to develop an appreciation for and enjoyment of reading. The core of our program for grades 7-8 is classic literature. It is enriched and expanded with contemporary selections. Students are taught to recognize the bias in a selection, as well as the hidden meaning and themes found in poetry and drama. Literature is used as a foundation to weave all the language art elements together and provide a model for writing. We reinforce student learning with the basic mechanics of writing (sentence structure, strong paragraphs, spelling, grammar, and vocabulary) and the writing process (prewriting, drafting, revising/editing, and publishing). Students create a variety of projects that strengthen oral communications, such as multimedia presentations, dramatic reading, storytelling, and speeches. K-5 resources include: The McGraw-Hill “Wonders” Series, Reading A-Z resources, Writing A-Z resources, and a variety of stories, novels, poetry, and informational texts. Middle School resources include: “Study-Sync” published by McGraw-Hill, Warriner’s Handbook (Holt, Rinehart and Winston), Vocabulary Workshop (Sadlier-Oxford) and a variety of short stories, poetry, novels, and informational texts. We believe a good foundation in elementary science is essential for a strong science program. By providing a research-based program through fourth grade we are strengthening the foundation for further exploration in science and developing connections with all of the curriculum. Beginning in fifth grade our hands-on experimentation and an inquiry based approach provide a meaningful setting for exploring science. The move towards technology and new resources, coupled with student teamwork, allow students to explore and learn practical work skills that will help them in the future. Main resources used are FOSS Science published by Delta for grades K-4 and Pearson “Interactive” Science for grades 5-8. The social studies program encompasses the areas of geography, history, and government while reinforcing comprehension skills to help students better understand the content. In the elementary grades K-5, students explore community life near and far. In addition, students develop an understanding of what it means to be a citizen and how the choices we make impact the world around us. In the middle school grades 6-8, students study American and world history, along with geography. Our program teaches an appreciation of history and different cultures in the world and promotes social awareness on local, national, and global levels. In grades K-5, the resources we use are; The Houghton Mifflin Harcourt, “Kids Discover,” booklets and the Harcourt, “Horizons,” text. Different teachers utilize these resources differently to meet learner objectives for their grade level. Grades 6-8 use a wide variety of resources compiled by our Social Studies department. The St. Charles music program provides a basic understanding of and appreciation for many types of music. Students learn techniques for listening, reading, and performing music and learn about famous composers and their works. Singing, playing instruments, speech, and movement are used to learn and experience musical concepts. Students in grades K-4 participate in the general music program. Students in grade 4 participate in general music but may also join the school band. Students in grades 5-8 have the option of participating in band or choir. The middle school choir program is divided into two sections: 5-6 choir and 7-8 choir. 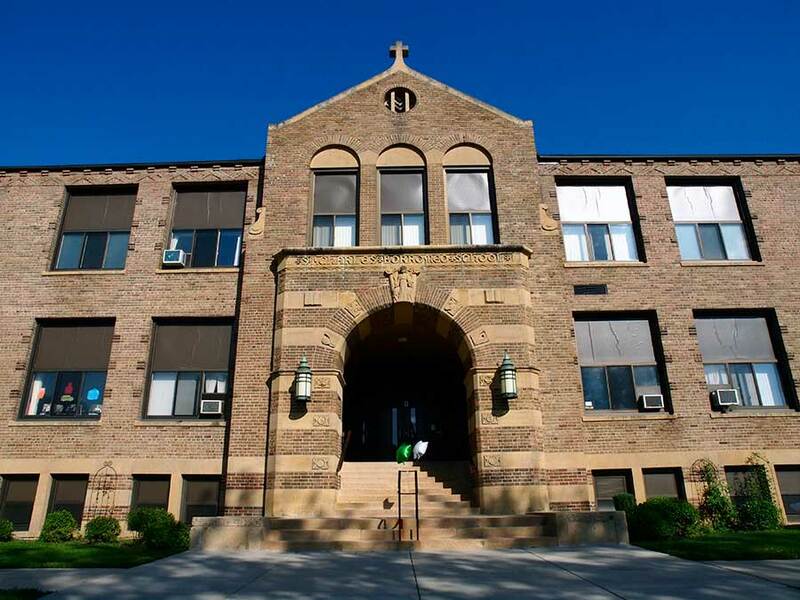 St. Charles School contracts with the Totino-Grace Fine Arts Academy for its band and Choir program. The staff of the Fine Arts Academy consists of Tim Hoffman, Suzanne Reyburn and Jessica Haut. They are area professionals and directors that are currently on staff at Totino-Grace High School. Students participate in group band as well as small group lessons. Instruction takes place twice a week at St. Charles. For more information and printable contracts for the band program, please see the school website or contact Tim Hoffman at 763-586-6311 or tim.hoffman@totinograce.org. The art program at St. Charles School offers students the opportunity to express their artistic creativity. Elementary grades learn the basic concepts of color, line, texture, and form while exploring a wide variety of art media. Middle school students build upon these basics and expand their knowledge as well as appreciation for art through the study of artists from the Renaissance period to the present. Students’ art work is often displayed throughout the building and has been displayed at the Minneapolis Art Institute, Banfill-Lock Art Center, and in Salo, Finland for a sister city exchange for all to enjoy. 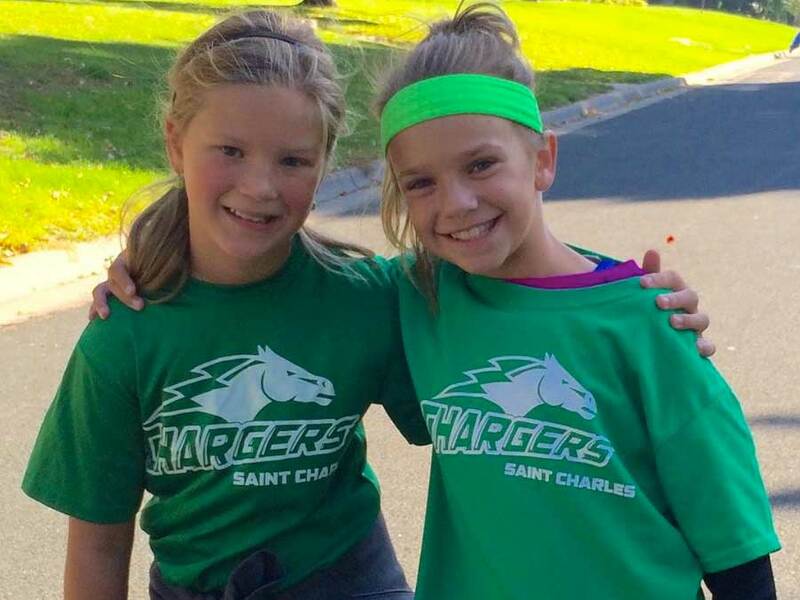 St. Charles School offers introductory instruction in Spanish to all grades. This program is designed to prepare our students for the study of foreign languages. Our curriculum covers basic vocabulary, conjugation, greetings and elements of the Latino culture. In grades K-4 we have a variety of resources from many different sources. In grades 5-8 we use the “Como te Va’” resources. St. Charles students work on a variety of computer skills starting in kindergarten. Students build a basic understanding of how computers operate. We seek to help students develop an understanding of the societal implications of computers. Students will understand the advantages, disadvantages, potentials, and limitations of using computers. Students will be instructed in the use of word-processing, spreadsheets, presentation, and other basic software. Students in the upper elementary and middle-school grades will learn about responsible citizenship on the internet. The use of social media, mobile devices, and changing technology in general will be discussed. The increased use of iPads, throughout the school, will help to enhance student learning. Technology equipment (computer hardware and software, iPads, interactive white boards, etc.) constitute sensitive equipment. If a student abuses such equipment, he/she will be suspended from using the equipment for one month. If there is another occurrence, suspension may be in effect for one year. A comprehensive physical education program is offered for grades K-8 consisting of activities and experiences designed to meet the health, safety, physical, developmental, and recreational needs of all students. The program has been the foundation of many awards earned by the school and our students. The library provides materials to meet the individual needs of students. The St. Charles library staff offers guidance in reading, locating research materials, and in other areas of curriculum as well as helping to develop good library skills and habits. The maximum number any student may have checked out at any one time is ten. If a student has an overdue book, no additional books may be checked out. Books may be checked out for two weeks in all grades. Books may be renewed for an additional two weeks but should be brought back to the library to go through the renewal process. Videos, DVDs, and CD ROMs may be checked out for two weeks, with a limit of two at any given time. All grade levels receive instruction in, “Second Step,” or social emotional learning at least once per week. In grades K-4 we include 5-mintue follow up lessons that teachers work into homeroom morning routines. The resource is called, “Second Step” and it is published by Committee for Children. We see this an opportunity to teach our students about leadership, problem solving, empathy, conflict resolution and other skills necessary for success. The implementation of this program was facilitated by Peacemaker Minnesota and as of the 2018-19 school year we offer it in all grades K-8. We measure the success of the program with the Olweus bullying survey. The results are processed and analyzed by the, Improve Group,” a consulting firm, and reviewed by our staff at the end or beginning of each school year. The academic policy aims to maintain the credibility of St. Charles Borromeo School with regard to the quality of our education, to help motivate our young people to combine their virtuous efforts and their God-given talents, and to enable our students to develop into persons who can richly fulfill God’s plan for them. In each year, students in grades 2-8 should average a passing grade in every class. A passing grade means averaging a minimum of “1” in each class. If a student’s GPA for any class falls below this minimum grade, the school principal will review their academic status. Those students who come under review may be required to spend additional time in areas of difficulty and may be suspended from extracurricular activities. If a student in grades 5-8 fails a course for the year, due to insufficient academic effort, that student may be placed on academic probation or may be considered for dismissal from St. Charles School at the discretion of the administrative team. 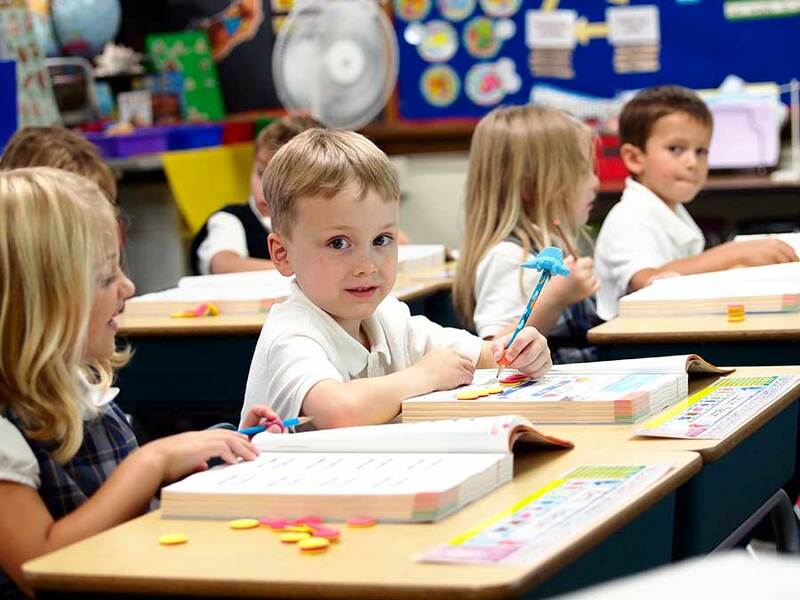 At St. Charles School, assessment is defined as the act of evaluating a student’s level of achievement in a specific subject area. The primary goal of assessment is to provide teachers with an understanding of how a student is performing so they may better understand and serve each child’s academic needs. This understanding supports the teacher in forming an appropriate educational path and expectations for each student. The secondary purpose of assessment is to provide each student and their parents with an accurate picture of how they are performing academically. This is important because parents are the primary educators of their children, and as their partners, it is our duty to keep them informed on their child’s academic progress. Formative assessment is a part of our teacher’s daily practice at St. Charles. Using these “Checks for Understanding,” tells teachers what the students are ready for and when. All of our curricular resources provide an extensive selection of formative and summative assessments making it manageable for teachers to assess their students regularly. Teachers modify assessments or create them as needed to unsure the highest level of accuracy when measuring student progress. Our teachers are all comfortable with running the variety of reports available through NWEA MAP testing. They are proficient at interpreting the data, using it to make ability groups, and knowing what each group is ready for. They are also able to identify a student’s or class’s strengths and weaknesses to make appropriate adjustments to the curriculum, daily lessons and assignments.